Farewell to the Avantgardistic State!! 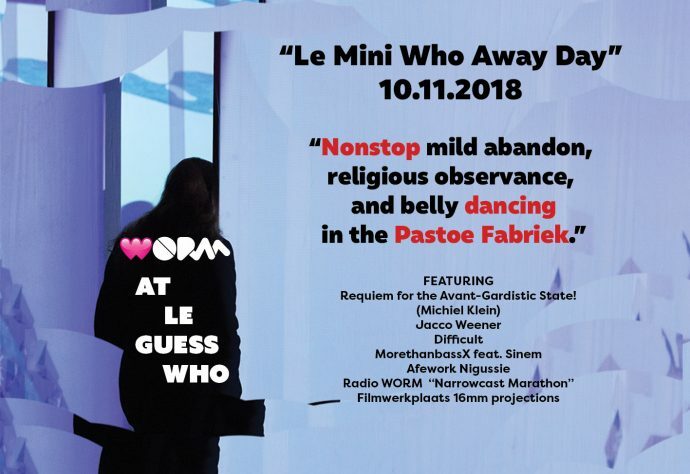 Expect hours of mild abandon, righteous grooving and belly dancing, religious observance, Dutch-Russian entente and quietly raving elegies at WORM’s Away Day on Le Mini Who. WORM says farewell to the Avantgardistic State in true style with a specially composed elegy to mark its passing in December 2018. The piece – entitled ‘Requiem for the Avant-Gardistic State’ – is written by Michiel Klein, known to many in Dutch Underground circles as guitarist in Bonne Apart, Adept, and co-mastermind behind Eklin (Samling records). Currently Michiel shreds his lead guitar to great effect in Rotterdam’s Lewsberg. Spiritual and intellectual support to Michiel’s piece will be given by Jacco Weener, volksartist extraordinaire and a leading light in the current Rotterdam Underground Baroque Opera revival. This support will take the form of a special introduction. WORM is on tenterhooks. Furthermore; WORM’s multidisciplinary muscle will well and truly be pulled courtesy of a screening of 16mm films from our very own analogue film maker space, Filmwerkplaats. There will be a Pirate Bay Narrowcast where anything could happen. Expect – or not – recordings of shambolic glory, deep insight and accidental learning experiences, or on-the-spot creative bonds forged with friends from Russia: you name it. It may not happen. Or probably all of it. Why not?